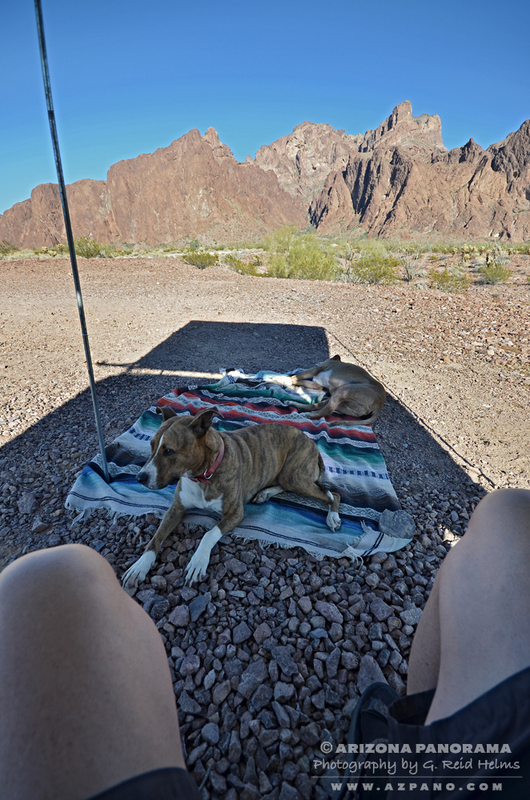 I spent a little over 24 hours at the Kofa National Wildlife Refuge in southwestern Arizona and that was not nearly enough. This is a big area of over 660,000 acres and there are plenty of roads accessing many parts of the mountain range. 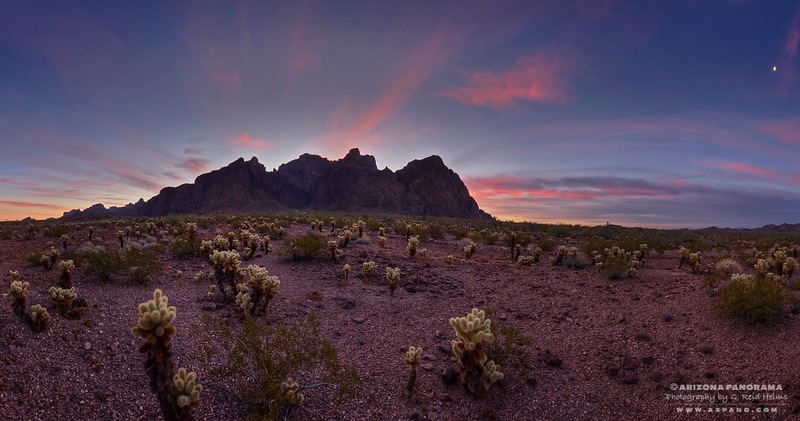 Established in 1939 to protect desert bighorn sheep, The Kofa National Wildlife Refuge is named after a large historic mine, The King of Arizona, or Kofa for short. 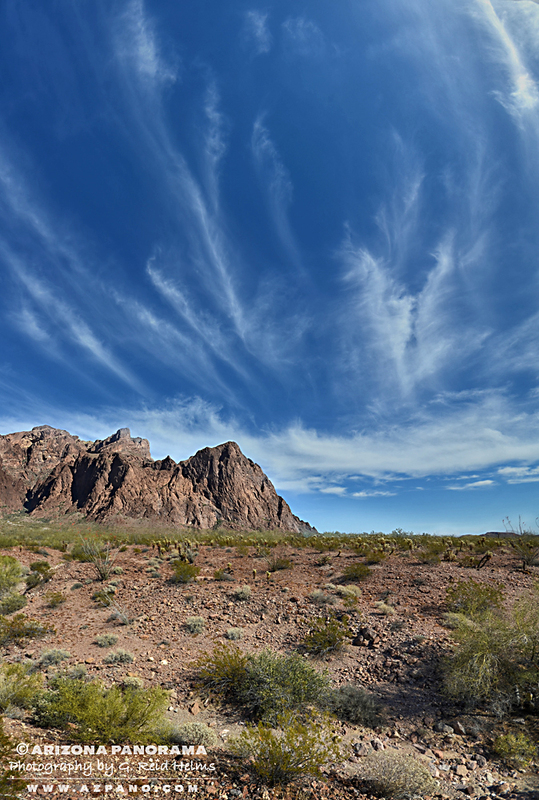 I started on the southern tip of the range in Palm Canyon, but wished I'd spent more time in Kofa Queen Canyon a little further north. I arrived mid-day and kicked back to enjoy the scenery. My campsite at the base of the mountain was a perfect vantage point to take in the mountains. I had 360-degree views back into the valley from my slightly elevated base camp. It was a perfect cool and breezy, late-March, winter day, yet I could feel summer was just around the corner. Orange glow looking west from the foothills of the Kofa Mountains. My photographic vision at Kofa was to get a moonlit mountain shot with the Milky Way rising behind it. I had envisioned a sweeping panorama with the drama of the cliffs and the mystery of the universe behind. I calculated a shoot time around 3:30 a.m. would work, but the clouds that rolled in at the end of the day ruined that idea. As usual, I made the best of it and decided to try something new. A nice straight section of the road nearby beckoned. 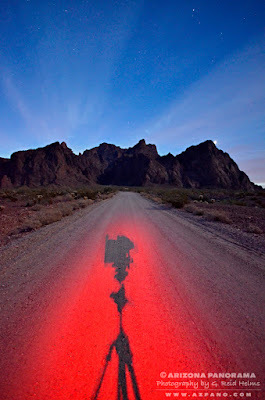 I used my headlamp to light paint behind my camera setup onto the road. It took several tries as my lamp was pretty bright. I had one version where the camera shadow went all the way to the mountain on the road and looked freakishly big. The moon was also very bright and diffused in the thin clouds. Seeing the clouds though, gave me hope for a nice sunrise. 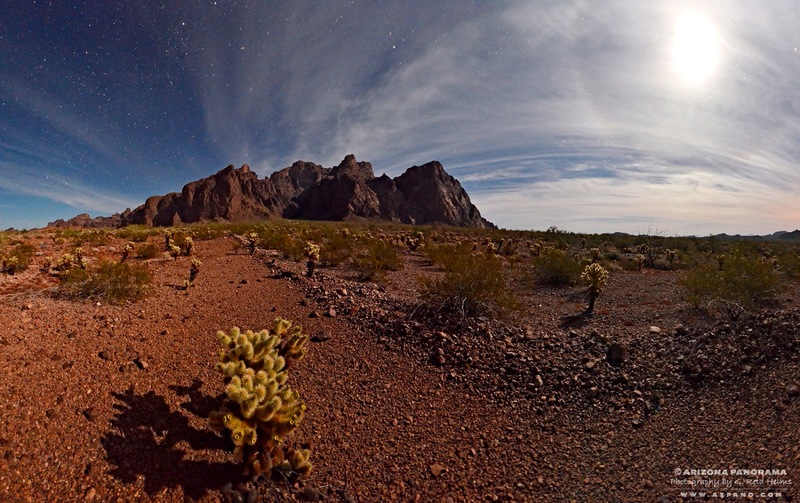 A big ring around the moon was an interesting element in this 180-degree pano. 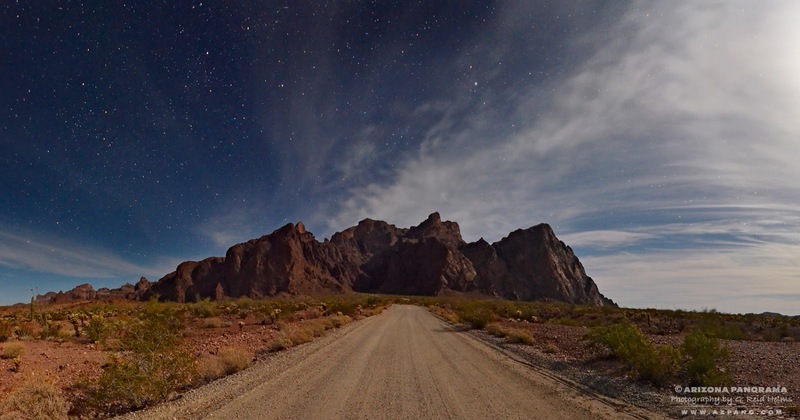 The glow from city lights of nearby Yuma can be seen to the right. The wispy clouds that gave me fits during the night were almost gone at sunrise. I had hopes this would turn out better than it did. 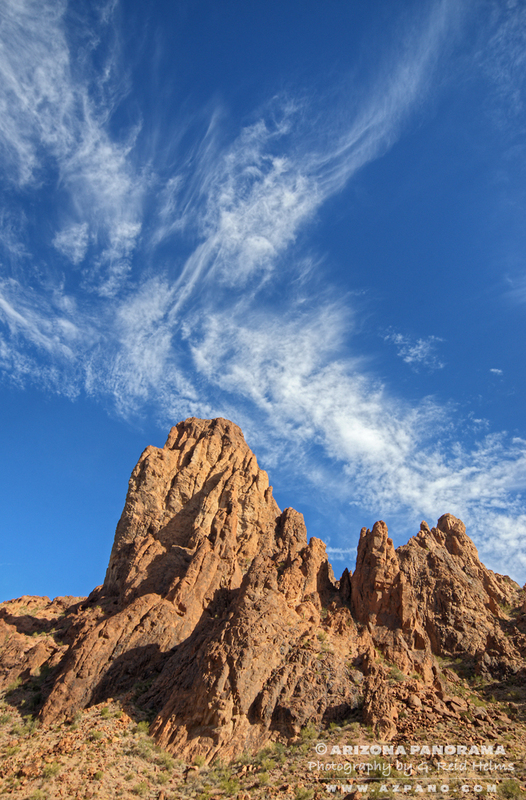 I have seen another photographers shots in the meantime and was in the wrong place that day... (like you ever know) Further north in Kofa Queen Canyon was perfect. But I hadn't been there yet. So, after my early start and shooting the sunrise, I headed up Kofa Queen Canyon. The road was just off the main road to Palm Canyon and a no brainer. 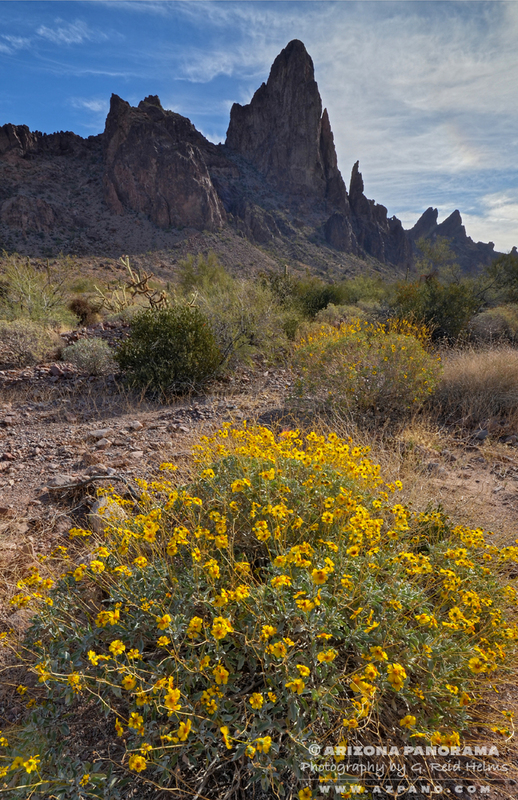 It was a couple miles through the desert foothills to the mouth of Kofa Queen Canyon. The mountains grow increasingly rugged and jagged a silhouette. The dirt road led into a pretty long canyon surrounded by huge rock spires. These were very picturesque formations that took my breath away. The road led back further and further following the same path as the winding wash. When I first entered the canyon, the clouds were very nice. But in less than an hour, they were all gone. I drove way back in towards the end of the canyon, but not all the way. The light had deteriorated and the road kept getting more and more sketchy. Next time I'll spend more time in this canyon. And I'll have to get back to Kofa soon. 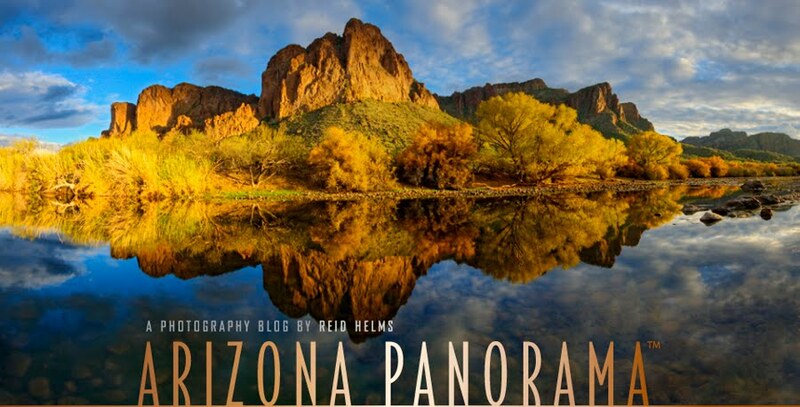 It was a bit of a long and boring drive though... 160 miles from Phoenix, but the payoff was well worth it. The mountain was spectacular and I totally lucked out with some clouds. And I learned a lot about where to go and what I'll do better next time. All content copyrighted and reproduction rights reserved.